Perhaps more than any other room in the house, the bathroom is a private retreat. It is a place where we perform important daily rituals and where we take the time to truly indulge ourselves with the wonderful luxury of solitude. The bathrooms collected here use their own design elements but have the luxury factor in common. 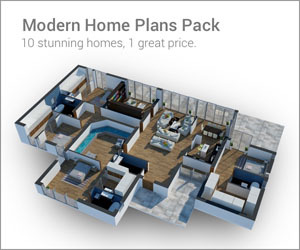 The bathroom is not a place to skimp and none of these designs do. An elevated platform puts this stunning marble tub on display while large windows fold open for the truly indulgent experience of bathing in the open ocean. Wood paneling surrounding the bath are another important element that set the bath area apart from the rest of the bedroom in this ensuite design. Double sinks nestled into a marble countertop that matches the marble tub are a simple luxurious feature. And what better way to relax after a decadent bath than to dry off in the setting sun on this private deck. One view is all it takes to experience the lovely luxury of this feminine bathroom. The floral wall design and curlicue light fixtures make this an ideal retreat for any time of day. For a less flowery option that is no less luxurious, peek inside this more masculine bath. Dark gray, black, and white are the height of masculine chic while a soaking tub and deep bowl sink offer everything you might need. The simplicity of this bathroom is the perfect contrast to the stunning views. By sinking the tub into the floor, the designer allows the bather to feel as if they are washing off in the still waters of a lake. The wood features in this bathroom mesh well with its views, letting you feel at one with the surrounding woods. Sticking with the theme of nature, this safari inspired bathroom features a zebra rug and mosquito netesque light fixtures for all the glamor of a safari with none of the danger or discomfort. Sleek floors and shining countertops make this bathroom the perfect mirror for the decadent city below. A large round tub is the focal point in this simple but inviting space. While this bathroom, designed as a showcase for Artecasa, UAE, may be a bit over the top for most average homes, it does make it possible to indulge in the possibilities of true luxury. With coppery tile and gilded accents, there is no question that this bathroom is fit for a queen. Side by side sinks go glam with intricate mirrors and reflective walls. This Moroccan inspired design creates plenty of glowing, flattering light with a combination of bare bulbs and hidden fixtures. A countertop that mimics a lovely dresser gives this space a more feminine touch. 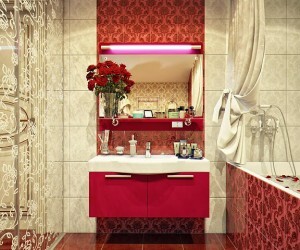 Suited for the most vain, this vanity area is clearly designed with one person who loves her privacy in mind. This black and white bathroom, with multiple countertop options, has a distinctively 80s feel to it. Black and white marble throughout is exactly what Gordon Gekko would have wanted. The angular designs in the counter are a bit futuristic, while other options remain more traditional. Storage space is always a concern in the bathroom, which is the room of sprays, creams, and salves. Finally, a colorful addition to this list, where purple tiles and vaguely gothic mirrors give this bathroom a bit of a haunted house vibe, but in a fun way.